After a temporary shut down, following Hezbollah's attack on an IDF convoy Wednesday, soldiers resume scanning the area for terror tunnels. The Israeli Defense Forces will resume Thursday their search for Hezbollah terror tunnels leading into moshav Zar'it, on the Lebanese border. 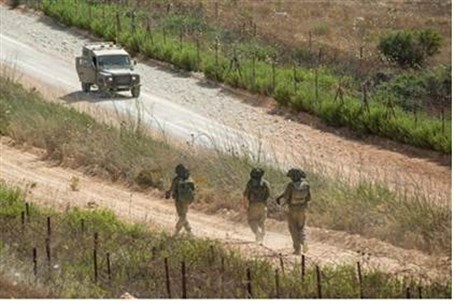 Detection services were shut down for security reasons Wednesday following Hezbollah's attack on an IDF convoy in the Har Dov area, in which two Israeli soldiers were killed. Seven additional soldiers were injured and are recuperating in hospitals throughout northern Israel. The IDF responded with retaliatory artillery fire into Lebanon. A Spanish UNIFIL peacemaker was killed in the exchange of fire. While northern citizens remain on edge, and security official stressed Wednesday night that neither Israel or Hezbollah have an in interest in an escalation of violence. However, he stressed, Israel must take necessary caution and judgment in the fact of Hezbollah's attack. In the meantime, the IDF has launched an investigation into the incident and the conduct of the soldiers. In particular, the IDF is interested in determining why the convoy was traveling along the border and who ordered the tour, when the Northern Command issued a directive to minimize the number of moving targets in the fact of maximal Hezbollah threats. The investigation has so far found that ten IDF vehicles drove in a convoy on Road 99 between Kiryat Shmona and Mount Hermon. They turned at the Tank Junction in the direction of the Rajar (Ghajar) village. Approximately two kilometers from the border, they arrived at a checkpoint and drove on to Har Dov, where they were ordered to turn back. About two hundred meters from the entrance to Rajar, Hezbollah opened fire on them. An anti-tank missile struck one of the vehicles, killing the Company Commander, Yochai Kalengel and his driver, Sgt. Dor Nini. An additional four missiles were fired on the convoy, damaging two vehicles and injuring seven soldiers.